For several months, New Yorkers have been reporting sightings of a rather unusual beast. 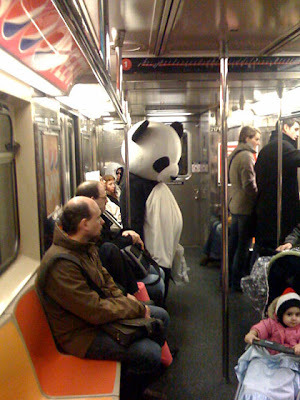 "Sad Panda," as he's called, has been showing up all over the city. He mopes around Wall Street. He pouts in front of FAO Schwarz. He rides the subway. (And in true New York fashion, he's generally ignored by his fellow passengers). He'll even offer tourists a melancholy hug. Who IS this bear? No one seems to know. But apparently he accepts tips. Oooo... that's so cute. and so sad! I just want to hug it!!! What do you think he would do if a bamboo stick was nearby? hey, i think he is upset over the environment or something, and he is pouting cause pandas are going extinct.... in a way he reminds me of Kaspar.... except he is living art. hahahahahha! i love it!!!! Poor guy. He's definantly not pretending to be sad for tips, but I wonder what made him chose the panda? Wow. That totally made me think of Kaspar. <3. Anyway, now I know what I'm going to do if I grow up! Also: That thing with the bull is the most immature thing I've seen in a looong time. I wonder if old pics of that "Panda Kindergarten" would cheer him up? Anonymous: I'm not really worried about the swine flu anymore. They say it's not even as dangerous as an average flu! They are closing schools around New York, but most people who get it seem to be fine after a few days. (I only know about one of the people who died. They say he had other health problems.) So don't worry too much about your cousins! Be careful, though, my grandmother, a nurse, says it might keep mutating and then come back in the fall and kill people, but everyone will be all, "oh, whatever, swine flu." It makes me wonder what kind of person that guy is.Is he protesting,depressed,or just wanting to be noticed? ?I wish stuff like this happened where I live. aww thats so cute! you know, that guy who started the "Free Hugs" movement should be wearing a sad panda suit. He'd get A LOT more hugs!!! That's great to hear! thanks kristen. As for the swine flu, THIS season is basically nothing to worry about, compared to normal flu. It's NEXT season they're worrying about. I'M just worried because next season we'll have to take 2 flu vaccines. from Edna Hill Middle School! Pandas are super cute, i'm reading the Kiki Strike inside the shadow city book as my 7th grade book report! it's a really great book!